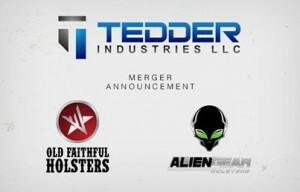 Announced today on each company’s respective Facebook pages, Alien Gear Holsters and Old Faithful Holsters are merging together under Tedder Industries. See our Alien Gear Holsters review. Alien Gear Holsters, the makers of quality, concealed carry holsters announces that they are merging with Old Faithful Holsters, also a manufacturer of concealed carry holsters and accessories, to become the leading hybrid holster manufacturer in the United States under parent company Tedder Industries. The merger of Alien Gear Holsters, based in Hayden, Idaho, with Old Faithful Holsters, based in Fort Smith, Arkansas, further increases the combined companies share in the concealed carry holster market. “The merger is also expected to result in greater efficiencies and significantly increase our market share,” said Thomas Tedder, president of Tedder Industries. For questions or customer service inquiries regarding Alien Gear Holsters please contact support@aliengearholsters.com or call 208-215-2046. For Old Faithful Holsters please contact support@oldfaithfulholsters.com or call 479-226-3082. 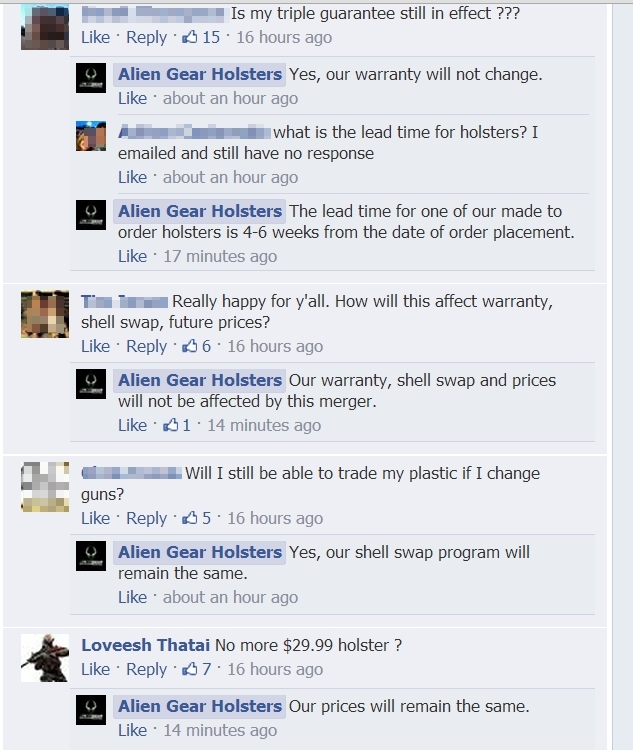 Alien Gear Holsters has addressed a number of concerns regarding how the merger might impact prices, production, lead time, shell trades or other aspects of their “Iron Clad Triple Guarantee,” saying that there will be no company name changes, they do not anticipate any changes in price and warranty service and shell trades will not be affected. Holster lead times will likely not change, as each holster is still custom made and hand assembled in the USA for each order. Q: Will our prices increase? 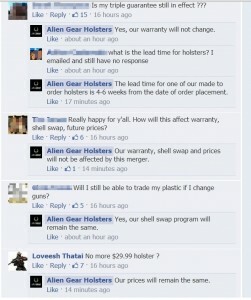 A: There is no plan to increase prices on Alien Gear Holster’s products, barring cost of material increases. Old Faithful Holsters prices and product selection will be adjusted in the coming weeks and months. This will be a win-win situation for our customers. Q: Will our guarantee be affected? A: Alien Gear Holster’s amazing Iron-Clad Triple Guarantee will remain unchanged. Old Faithful Holster’s warranty and guarantee will be changing in the coming weeks and months to be equivalent to Alien Gear Holster’s. Q: Will our lead time increase/decrease? A: The lead time on orders should remain unaffected by the merger. Q: Is there going to be a name change? A: Both Alien Gear Holsters and Old Faithful Holsters will retain their brand names and individual websites. Q: Will the merger affect the quality of the products? A: The merger will not negatively impact the quality or workmanship of either Alien Gear Holster’s or Old Faithful Holster’s products. Both brands will maintain their high standards for quality and craftsmanship. Q: Will the merger affect customer service? A: The merger will not negatively impact customer service. We will continue to maintain our high standards of customer service with both brands. how is this going to effect the alien gear prices? they pretty much have to go up. what about warranty? will they still honor warranty and life time trade ins on the shells? If I wanted Alien Gear brand when you merge will I be able to still get the alien on the holster?